Huge Marine Drill Confirms Ground Invasion of Libya, from Kurt Nimmo at InfoWars. Exercise Mailed Fist, covering much of theeast coast of the United States, has been underway this week to test equipment and readiness for a ground invasion planned for some time in October. 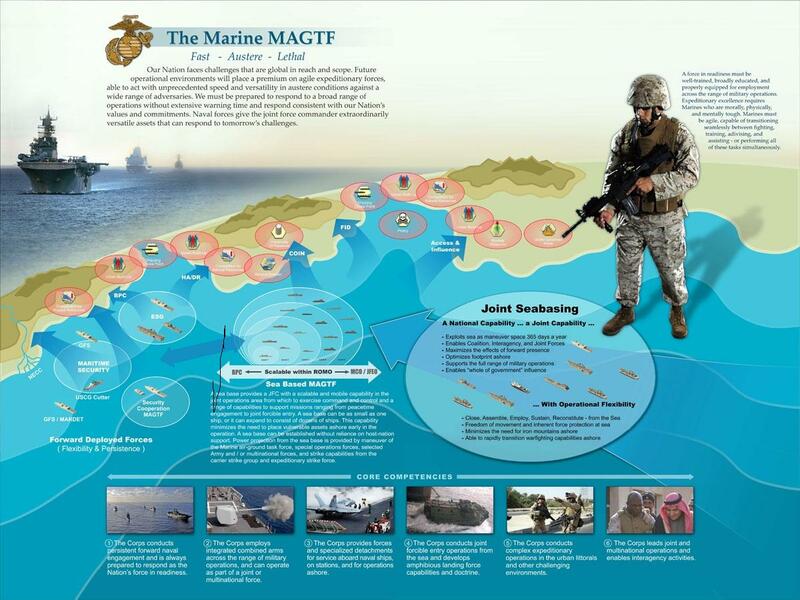 “On Sunday, CNN reported on a huge Marine war exercise dubbed Exercise Mailed Fist. “The exercise is designed to test the capability of every type of Marine Corps aircraft, including MV-22 Ospreys and F/A 18 Hornets, as well as some Navy ships and Air Force planes,” CNN reported. The exercise will encompass a large area on the U.S. East Coast – from Quantico Marine Base in northern Virginia to the Navy’s Pinecastle Bombing Range in Florida. Most of the exercise activity will occur above North and South Carolina. The drill begins today and ends on Friday. Thousands of Marines will take part. According to CNN, it will be biggest drill of its kind ever held on the East Coast. “It appears the Pentagon has released information about the exercise exclusively to CNN. A Google News Search produces scant results on Exercise Mailed Fist. CNN is a notorious focal point for Pentagon psyops. In 2000, the Pentagon confirmed that psyops personnel, soldiers and officers, have worked in the CNN headquarters in Atlanta. In February of that year, Dutch journalist, Abe de Vries, reported on the presence of U.S. Army personnel at CNN for the Dutch daily newspaper Trouw. Obama will visit Fort Drum in New York on Thursday. It is speculated he will announce a decision on drawing down U.S. forces in Afghanistan, but the visit may also be related to a plan to send ground troops into Libya. The huge military exercise comes at a critical time. As we reported last week, the United States is in the preparatory stages of a ground invasion of Libya and a campaign against Syria. Syria and Iran are also subject to speculation as possible targets. The Marines run exercises all the time, but this is a particularly large scale exercise. “Infowars.com has received alarming reports from within the ranks of military stationed at Ft. Hood, Texas confirming plans to initiate a full-scale U.S.-led ground invasion in Libya and deploy troops by October. The source stated that additional Special Forces are headed to Libya in July, with the 1st Calvary Division (heavy armor) and III Corps deploying in late October and early November. Initial numbers are estimated at 12,000 active forces and another 15,000 in support, totaling nearly 30,000 troops. A caller identified as “Specialist H” working for mortuary affairs under USCENTCOM revealed that there have already been American casualties inside Libya. He confirmed that at least 2 soldiers and 3 civilians have died from combat bullet wounds, something the media has yet to report, and needs to investigate and address. 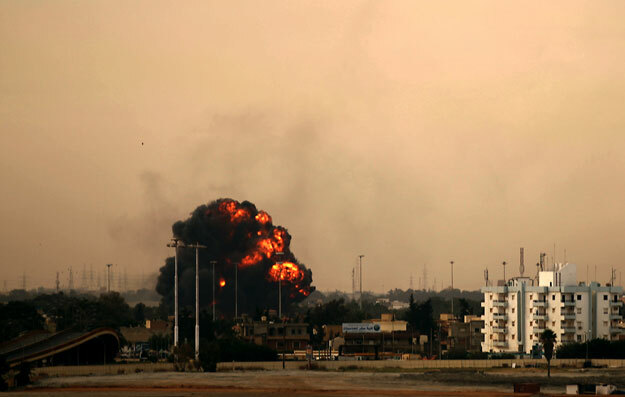 Geo-political expert Dr. Webster Tarpley also told the Alex Jones Show today that wider war is being planned for Libya, while the count of simultaneous U.S. wars has reached five conflicts– including Iraq, Afghanistan, Pakistan, Libya and Yemen. The potential for an even greater spread of regional conflict could well provoke a World War III scenario, drawing in tenuous nations like Syria, Lebanon, Iran or even Saudi Arabia, according to Tarpley. If this information is correct, I guess we can hang up any hopes that United States policy will make sense or present a positive face to Africa or anywhere else in the world. “President Obama rejected the views of top lawyers at the Pentagon and the Justice Department when he decided that he had the legal authority to continue American military participation in the air war in Libya without Congressional authorization, according to officials familiar with internal administration deliberations. 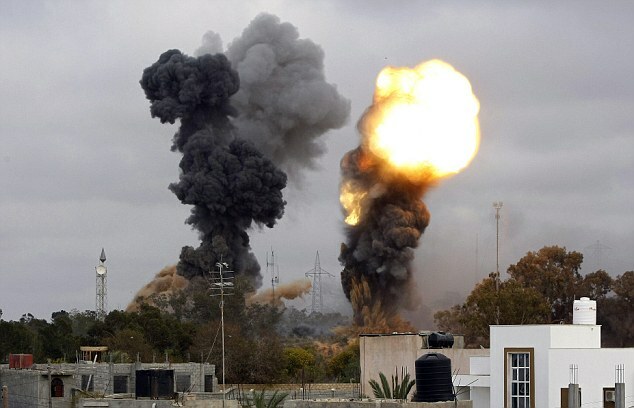 If US personel are already dying from gunfire in Libya, there are hostilities. In addition to the President seizing “blatently unconstitutional powers” I also understand the military personel in Libya are receiving combat pay, another indicator of genuine hostilities. Elements from the 2nd Marine Aircraft Wing at Cherry Point are being joined in the 11-day exercise by Marines from New River, Beaufort, S.C. and other Marine, Navy and Air Force units from Florida to Virginia. The exercise, the largest for area Marines in a decade, ends Friday. Essentially, MWSS-274 mobilized as though it was deploying to a faraway place to create an operational air base capable of supporting up to 600 personnel. Marine Attack Squadron 542 brought a fleet of AV-8B Harriers and associated support personnel to Bogue Field. The first thing the Marines got operating on the first day was their water purification system, which puts out 21,000 gallons a day drawn right from Bogue Sound. “The water is actually eight times more pure than the water that comes out of your tap at your house,” said Cpl. Matthew L. Cheney, a water purification support technician. He said each purifier uses micro-filtration and reverse osmosis to remove impurities, including nuclear or biological warfare agents that might be in the water during a battlefield situation. Over the weekend, Marine families were invited to the camp, and all were able to get a taste. “Everybody was able to come by and drink it, and 10 minutes before it had been home to a fish,” Conway said. Clean water is the foundation of the operation, Conway said. “If you lose that capability, you’ve basically shut everything down,” he said. Next in line would be nourishment, and the field mess is able to prepare three hot meals a day. Heavy equipment was brought in to build temporary runways and helicopter landing pads. MWSS-274 firefighters and their trucks and equipment came along too, and crews are always ready with reflective gear capable of pulling a pilot from a downed plane burning at 1,200 degrees. 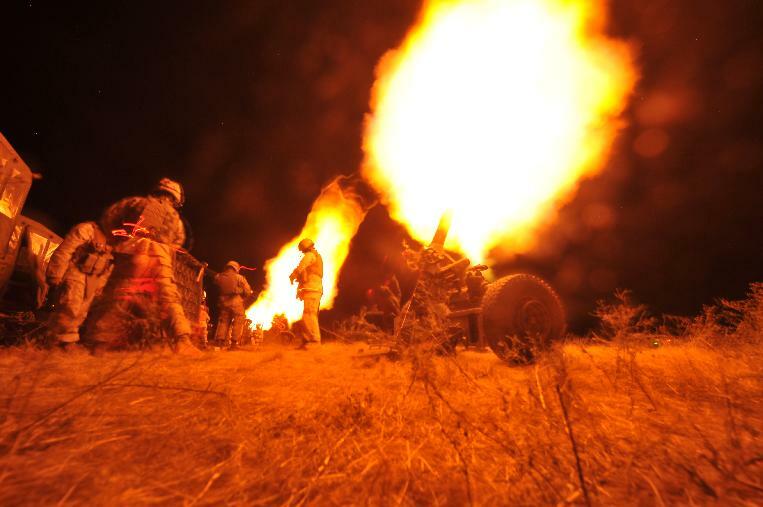 “Our job is not to put out the fire but to make rescues,” said Gunnery Sgt. Raymond Secoy, leader of the aircraft firefighting crew. All 2nd MAW aircraft, from jets to KC-130J refuelers to helicopters, are involved in the exercise. VMA-542 pilot Capt. B.R. Stevens said Harriers are outfitted with small practice bombs and practice missiles that converse electronically with the pilot as though they were the real thing. “It allows the pilot the same flight characteristics as a 500-pound bomb,” he said. “You are able to get the same training as regular ordnance, except you are not carrying the weight or drag of 1,500 pounds of dumb bombs,” Stevens said. He said Mailed Fist was good for his 50-man support crew. “This exercise gets us in the mindset,” Peck said. Lance Cpl. Steve Squires is a powerline mechanic. “We get into the right mentality and get to see how everything is going to get set off and how everything is going to go down,” he said. Conway said the training less than 40 miles from Cherry Point offers the same benefits as training at more remote locations. “It allows us to have the flexibility to make some honest mistakes and to learn the lessons on the cheap and you apply them so you don’t keep making those mistakes again and then you can apply those lessons learned when you are going a little further away when you don’t have those instant reach-back capabilities to Cherry Point,” he said. And saving money while training is a key part, he said. Air and ground assets from Virginia to Florida are part of a massive readiness exercise led by the 2nd Marine Aircraft Wing at Cherry Point. 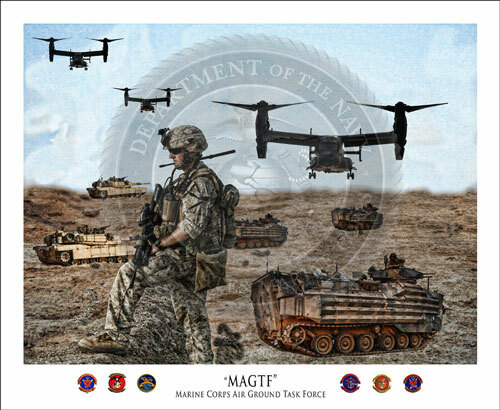 Exercise Mailed Fist 1-11 is continuing through June 24, and residents in the area should expect an increase in military aircraft and ground activity in the region, according to a release from Cherry Point. The exercise is one of the largest for the 2nd MAW in recent history. It is designed to ensure that personnel remain prepared to serve as part of a rapid-deployment aviation force in readiness, according to the release. The exercise involves Marine units from Cherry Point, New River and Beaufort, S.C., along with other Marine, Navy and Air Force units from the East Coast, according to the release. Bases involved include Cherry Point, New River, Bogue Field, Atlantic Field and Camp Davis, as well as others in the region such as Beaufort, S.C., Vadalia Regional Airport in Georgia, Fort A.P. Hill, Va., Fort Pickett, Va., MCAS Quantico, Va., and the Navy Pinecastle Bombing Range in Florida. The training involves, for the first time in more than 10 years, the deployment of a Cherry Point Harrier squadron to Bogue Field in Carteret County, from where it will operate as part of the exercise, according to the release. The training also involves all other type of aircraft operated by the 2nd MAW. The training also involves a newly built Wing Operations Center at Cherry Point that uses a variety of communications technologies, according to the release. Previous such exercises have involved deployment to the West Coast, and by combining previous separate training events, the cost of the training is less expensive, according to the release. A specific figure was not provided. Is NATO bombing two thirds of the population of Libya in order to protect the other one third from the (alleged) danger of being slaughtered? If the rebels take Zlitan, they would be within 85 miles (135 kilometers) of the eastern outskirts of Tripoli. … they face challenges in advancing on the city. R2P, responsibility to protect? (read: rush to plunder) is certainly selective. NATO’s chosen third derive their tenuous legitimacy solely from NATO’s choice to back them. Meanwhile, the R2P is continuing bombing every half hour round the clock, 50 or 60 times a day. In Zlitan, where the rebel leader said 2/3 of the population, the majority, do not support the rebels, only a minority does support them, the rebels are calling for NATO bombs so they can seize the town. Nato insists it is taking an active role, but Misrata’s rebels say the alliance’s current level of engagement will not be enough to save Zlitan’s population. This is to save the 1/3 of the population the rebels claim supports them. The rebels are fine with bombing the other 2/3 of the population. No one could describe that as democratic in spirit or in action. … “second front” in Benghazi. This front consists of the armed groups of civil militia, ordinary citizens who are seeking restoration of the rule of law in Benghazi. They declared that they wouldn’t stand so-called “rebels” any more in their city, who are fighting each other and expose violence on city’s population. It is difficult to confirm, especially relying on western media. But it appears credible based on what we hear about the rebels. Claiming that NATO is only bombing military targets is disingenuous. Believing the bombs only strike or aim at military targets is naive. 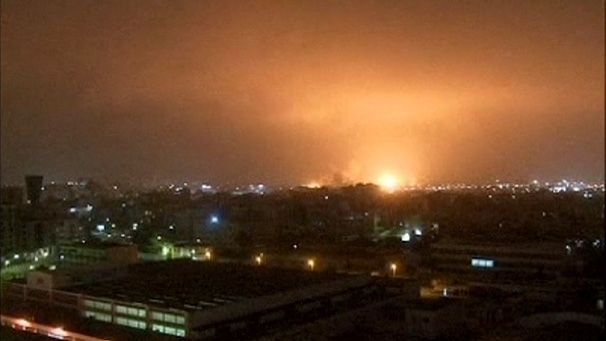 Here are a few pictures of the bombing in Tripoli. … said Saturday that “we don’t want to see a new colonialism in Africa,” when asked about China’s growing influence in the continent during a television interview in Lusaka, Zambia. She might as well have said: “we don’t want to see a new [read Chinese] colonialism in Africa,” so we are bringing back the old colonialism. In fact the old colonial masters are back as well, joined together in NATO. Her words have truth, but the problem is hardly limited to China. Clinton’s words should cause people to fall about laughing except for the fact that people are dying in Libya, in Somalia, in Ivory Coast, in the DRC, and in many more places. On the plus side for US corporations, the dying and destruction provide product demonstrations, testing and merchandising for US weapons manufacturers. It is all good for business. 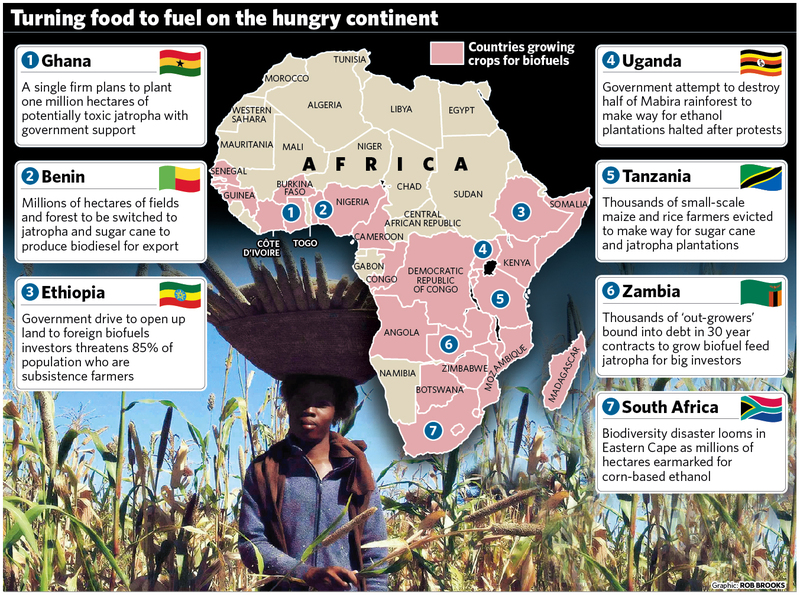 If the US was providing ANYTHING other than military assistance in Africa it might not be so bad. It is so distorted that a lot of people in the US think that the military assistance IS foreign aid rather than the coercion and dominance it is in fact. There is something about Clinton’s words reminiscent of the way Ben Ali and Mubarak eloquently demonstrated how far removed they were from the realities in their streets, worse than the fuddling effects of alcohol. Hilary Clinton’s warning to African nations against “the creeping new colonialism” of foreign investors and governments interested in extracting natural resources to enrich themselves would have been meaningful, if the US had not already gone kinetic in Libya and the Ivory Coast for the same reasons. I have no great love for the Chinese presence in Africa. They are as ruthless and exploitive as anyone, including of their own people. And I really don’t appreciate them bringing Chinese labor to Africa to do the work. But at least African countries have some chance to maximize their own development with Chinese money if they are willing to take the opportunity and be tough and forward thinking. Unfortunately we have a lot of bad leadership around the continent (and around the world, including in the US) who think the purpose of government is to enrich the governing class. And the US is offering Africa nothing but military government, which is the main source of terrorism in Africa, and something most people in Africa want to leave behind. And check the show of pride. US/NATO veil the threat of terror by supporting terror, supporting al Qaeda sympathisers in Benghazi and calling them fighters for democracy. US/NATO will check the show of pride by destroying the infrastructure and economic success, the pride of the Libyan people, who are not beholden to the US or NATO for their success. The US and NATO seek to end Libyan independence and with it to undermine the African Union and African independence at the same time. 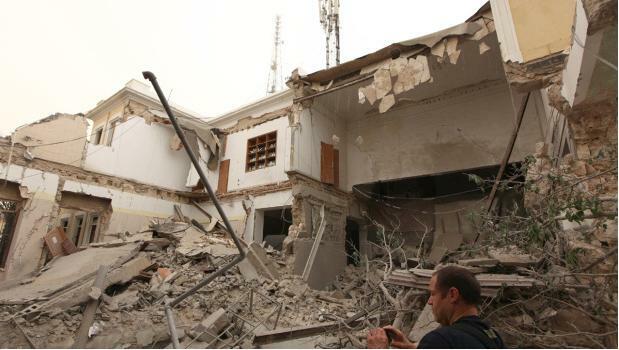 This building was destroyed by the NATO bombing of the North African state of Libya. It housed a civil society council with a school for special needs children next door. If R2P had anything to do with protecting civilians, some of that protection would be given to the black Libyans and immigrants who are being massacred by the rebels. Ethnic cleansing committed by the rebel groups is a big risk for black Libyans and African migrants. Hundreds have already been murdered. The wave of migrants fleeing Libya has intensified since the US, France, Britain and NATO launched their war against Libya on March 19. The response of NATO and the European powers to the influx of African asylum seekers has been one of unadulterated hostility and racism. The US and NATO don’t even pretend to exert their responsibility to protect those civilians. Protection of civilians has nothing to do with the assault on Libya. 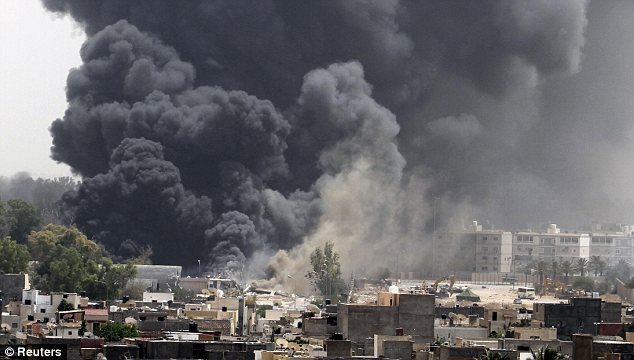 Does anyone think the massive numbers of bombs dropped on the Tripoli area have left civilians magically untouched? There have been 9,183 sorties flown so far. Those bombs are not protecting civilians. … targets are being bombed, and then hit again if BDA (Bomb Damage Assessment) reveals that total destruction was not achieved. … the Pentagon is the true epicenter of American policy toward the Arab Reawakening. Briefly paralyzed early in the year by the specter of resurgent Arab nationalism in the planet’s most vital energy reservoirs, Washington quickly launched a massive military assault on Libya in collaboration with European mini-imperialists to show the Arab world who’s really the boss. In the Persian Gulf region, the Saudi Arabian monarchy gathered up their fellow emirs, sultans and sheiks to safeguard the common patrimony of royal families against democratic or nationalist subversion. 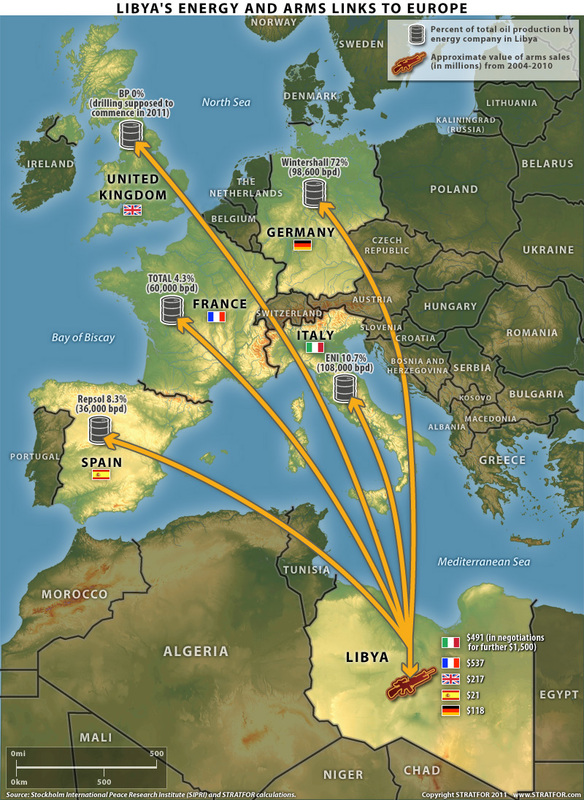 Oil and Arms, Libya and Europe (click to enlarge enough to read) A range of Libyan business and investment is deeply intertwined with both Europe and the US, including arms. The grandkids, ages 6 months to two years, were, of course, totally apolitical and, presumably, quite cute. But vaunted American “compassion” does not extend to the grandbabies of evil Arab cartoon-men. … Killing Gaddafi’s son and three grandchildren was no crime, since in American eyes they are no more than satanic versions of Daffy Duck’s cartoon nephews Huey, Dewey and Louie. Hillary Clinton went to Italy during the first week of May and was able to persuade the Italians to continue Italian support for the bombing. Great Britain funded an Al Qaeda cell in Libya, in an attempt to assassinate Gadaffi. The main opposition group in Libya now is the National Front for the Salvation of Libya. This opposition group is being funded by Saudi Arabia, the CIA, and French Intelligence. This group unified itself with other opposition groups, to become the National Conference for the Libyan Opposition. It was this organization that called for the “Day of Rage” that plunged Libya into chaos on February 17 of this year. Why is the United States so opposed to Gadaffi? He is the main threat to US hegemony in Africa, because he attempts to unite the continent against the United States. This concept is called the United States of Africa. Don’t kid yourself. Nobody gives a damn about suffering in Libya or Iraq. You don’t bomb a village to save it. The U.S., Britain and NATO are the bullies of the neighborhood. The enforcers for Big Oil. Moammar Gaddafi was drafted as imperialism’s designated demon in North Africa, while Shi’ite Iran served as the scapegoat for royal reaction in the Gulf. The monarch-dominated Gulf Cooperation Council, acting through a confused Arab League, gave moral cover to the Euro-American bum-rush of an equally confused United Nations Security Council. “No-fly” Resolution 1973 landed on the heads of Libyan soldiers amidst the methodical destruction of the country’s infrastructure. Thousands of miles to the east, the Saudis and lesser royals brutally smashed the democratic aspirations of Bahrain’s Shia majority, and schemed to save Yemen from a peaceful people’s uprising. No sooner was the UN Security Council resolution to “protect” Libyan civilians issued, than it was mangled into a mandate for regime change and political assassination at NATO’s discretion. International law became its opposite. R2P is now wholly discredited in the eyes of the conscious world –which, unfortunately, excludes most Americans. The International Criminal Court, to which the United States is not a signatory, but which it deploys to indict selected Africans – and only Africans – for human rights offenses, has been eclipsed by Obama’s imperial offensive. Why go through the motions of indicting designated enemies, when Full Spectrum Dominance enables the U.S. to execute them at leisure. AFRICOM will have a hard time reestablishing its bona fides with African governments, which were fairly tenuous even before the Libyan intervention. Although regaining African countries’ trust will be difficult, it is not impossible. In word as well as in deed, the idea should be to cast the Libyan operation not as a mistake but as an exception. Unfortunately Libya is not an exception, as Pepe Escobar points out, it is just the latest of close to 50 US military interventions in Africa going back approximately 50 years. Libya is just the latest military intervention in a long line of military interventions. Like Groucho Marx, Mr. Stevenson is asking Africans not to believe their own lying eyes. This “kinetic activity” took place after former US secretary of state Henry Kissinger had been hammering his endgame for Libya on at least three different occasions; at George Washington University’s Elliot School of International Affairs; at an Aspen Institute session on “Values and Diplomacy”, also in Washington; and at the Bretton Woods II conference in New Hampshire. Gaddafi is the perfect villain for this Anglo-French-American farce unworthy of French playwright Georges Feydeau. For all his dictatorial megalomania, Gaddafi is a committed pan-African – a fierce defender of African unity. Libya was not in debt to international bankers. It did not borrow cash from the International Monetary Fund for any “structural adjustment”. It used oil money for social services – including the Great Man Made River project, and investment/aid to sub-Saharan countries. Its independent central bank was not manipulated by the Western financial system. All in all a very bad example for the developing world. Breaking up Libya would be just the hors d’oeuvres for breaking up other parts of Africa where China has sizable investments. Yes, because if Western boots hit the ground in northern Africa, the “footprint” will reach the Sahel – which is already in turbulence; Mali and Niger are receiving weapons from the “rebels” in Libya that are ending up in the hands of al-Qaeda in the Maghreb (AQIM). The powers that be in Algeria and Morocco – where pro-democracy protests continue non-stop – are already freaking out. … Gates had already misled the US Congress a few weeks ago, saying that the US role in Libya would end once NATO was in command. Here are some things the Hellfire missiles will be up against in Libya. A gross domestic product per capita of US$14,192; unemployment benefits of around $730 a month; nurses being paid $1,000 a month; no major taxes; free education and medicine; interest-free loans for buying a car and an apartment. Quite a few unemployed Americans wouldn’t mind a one-way ticket to Tripoli. The attack of the drones is on so Washington may pretend it’s not by any means expanding its “kinetic military action” – which is not a war. And we are seeing a lot of AFRICOM military activity in North Africa, particularly directed at Algeria and Morocco. The US/NATO Libyan intervention is more the rule than the exception, a clear precedent for future “kinetic actions”. The predatory and criminal character of the US-NATO operation becomes ever more apparent the longer it drags on. Washington, London and Paris hope to not only seize control of Libya, but also increase their influence in neighbouring states that have been convulsed by revolutionary uprisings. The NATO powers aim to use Tripoli as a centre of operations throughout North Africa, preventing any further erosion of their strategic and economic interests in the region. An African satellite only cost a onetime payment of US$400 million and the continent no longer had to pay a US$500 million annual lease. This is how a symbolic gesture of a mere US$300 million changed the life of an entire continent. Gaddafi’s Libya cost the West, not just depriving it of US$500 million per year but the billions of dollars in debt and interest that the initial loan would generate for years to come and in an exponential manner, thereby helping maintain an occult system in order to plunder the continent. The African Monetary Fund is expected to totally supplant the African activities of the International Monetary Fund which, with only US$25 billion, was able to bring an entire continent to its knees and make it swallow questionable privatisation like forcing African countries to move from public to private monopolies. No surprise then that on 16-17December 2010, the Africans unanimously rejected attempts by Western countries to join the African Monetary Fund, saying it was open only to African nations. It is increasingly obvious that after Libya, the western coalition will go after Algeria, because apart from its huge energy resources, the country has cash reserves of around €150 billion. This is what lures the countries that are bombing Libya and they all have one thing in common – they are practically bankrupt. It is disconcerting to say the least that for the first time in the history of the United Nations, war has been declared against a people without having explored the slightest possibility of a peaceful solution to the crisis. In Asia Times Ellen Brown asks Libya all about oil, or central banking? Several writers have noted the odd fact that the Libyan rebels took time out from their rebellion in March to create their own central bank – this before they even had a government. In it [a 2007 “Democracy Now” interview of US General Wesley Clark] he says that about 10 days after September 11, 2001, he was told by a general that the decision had been made to go to war with Iraq. … they planned to take out seven countries in five years: Iraq, Syria, Lebanon, Libya, Somalia, Sudan, and Iran. The most renegade of the lot could be Libya and Iraq, the two that have actually been attacked. During the past year, the idea was approved by many Arab countries and most African countries. The only opponents were the Republic of South Africa and the head of the League of Arab States. All of which prompts a closer look at the BIS rules and their effect on local economies. … FDI [foreign direct investment] denominated in foreign currencies, mostly dollars, has condemned many national economies into unbalanced development toward export, merely to make dollar-denominated interest payments to FDI, with little net benefit to the domestic economies. That would explain where Libya gets the money to provide free education and medical care, and to issue each young couple $50,000 in interest-free state loans. It would also explain where the country found the $33 billion to build the Great Man-Made River project. [… the largest and most expensive irrigation project in history, the US$33 billion GMMR (Great Man-Made River) project. Even more than oil, water is crucial to life in Libya. The GMMR provides 70% of the population with water for drinking and irrigation, pumping it from Libya’s vast underground Nubian Sandstone Aquifer System in the south to populated coastal areas 4,000 kilometers to the north.] Libyans are worried that North Atlantic Treaty Organization-led air strikes are coming perilously close to this pipeline, threatening another humanitarian disaster. So is this new war all about oil or all about banking? Maybe both – and water as well. With energy, water, and ample credit to develop the infrastructure to access them, a nation can be free of the grip of foreign creditors. And that may be the real threat of Libya: it could show the world what is possible. Washington and its European allies are clearly readying an intensified campaign aimed at ousting the government led by Muammar Gaddafi and installing a client administration in Tripoli. NATO leaders now make little effort to conceal the reality that military operations are centrally aimed at removing Gaddafi from power—a goal that is not authorised under the “mandate” supposedly provided by UN. American, British, and French leaders have deliberately sabotaged any possibility of a negotiated end to the civil war in Libya between the Gaddafi regime and the opposition forces based in the eastern city of Benghazi. Italian government efforts to resolve the situation by allowing Gaddafi to make a “political exit” were derailed by the demand for war crimes charges against the Libyan leader issued last month by the International Criminal Court’s chief prosecutor. It now appears likely that the timing of NATO’s 90-day bombing authorisation is at least partly aimed at scuttling the African Union’s demands for a “roadmap” that involves an immediate ceasefire, including an end to NATO bombing. South African President Jacob Zuma visited Tripoli on Monday to meet with Gaddafi; afterwards he said that the Libyan leader was ready to implement the African Union’s roadmap. 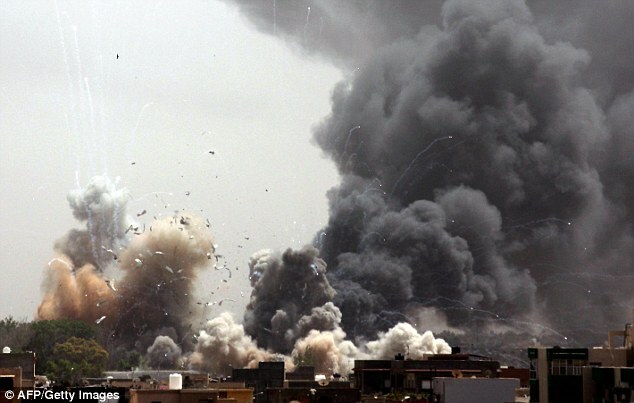 NATO responded by unleashing fresh airstrikes immediately after Zuma flew out of the Libyan capital. According to NATO figures, American and European air forces have conducted 9,183 sorties since March 31. 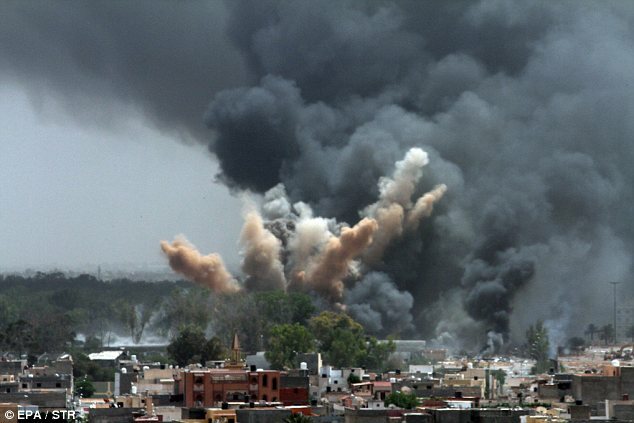 The Obama regime’s invasion and bombing of Libya is a continuation of a longstanding imperial practice designed to enhance U.S. power via the installation of client regimes, the establishment of military bases and the training and indoctrination of African mercenary forces dubbed “collaborative partners.” There is no question that there is a rising tide of imperial militarism in the U.S. over the past several decades. Most of the U.S.’ African empire is disproportionally built on military links to client military chiefs. The Pentagon has military ties with 53 African countries – including Libya prior to the current attack. AFRICOM, despite its assigned role as a vehicle for spreading imperial influence, has been more successful in destroying countries than in gaining resources and power bases. The war against Somalia, displacing and killing millions and costing hundreds of millions of dollars, enters its 20th year, with no victory in sight. Apart from the longest standing U.S. neo-colony, Liberia, there is no country willing to allow AFRICOM to set up headquarters. Most significantly, AFRICOM was unprepared for the overthrow of key client regimes in Tunisia and Egypt – important “partners” in patrolling the North African Mediterranean, the Arabian coast and the Red Sea. The continent-wide presence of AFRICOM has been matched by its incapacity to convert “partnerships” into effective proxy conquerors. The attempt to foster “civil-military” programs has failed to secure any popular base for corrupt collaborator regimes, valued for their willingness to provide imperial cannon fodder. The continuing North African uprising overthrew the public face of the imperial backed dictatorships. As the popular Arab revolt spreads to the Gulf and deepens its demands to include socio-economic as well as political demands, the Empire struck back. AFRICOM backed the assault on Libya, the crackdown on the prodemocracy movement by the ruling military junta in Egypt and looks to its autocratic “partners” in the Gulf and the Arabian Peninsula to drown the civil society movements in a blood bath. The growing militarization of U.S. imperial policy in North Africa and the Gulf is leading to a historic confrontation between the Arab democratic revolution and the imperial backed satraps; between Libyans fighting for their independence and the Euro-American naval and air forces ravaging the country on behalf of their inept local clients. Twice the African Union has tried to resolve the Libyan conflict peacefully, and both times it has been resoundingly ignored and rebuffed. Whether the subject is banking or oil or water or China, it is quite clear that US/NATO sees Libya’s successs and independence as bad example for the rest of Africa and a threat to US hegemony. Ordinary citizens and leaders in Africa should view the Libyan intervention as a serious threat to their independence and success, now and in the future, a threat to the well-being of the entire continent. R2P, the Rush To Plunder is on, for banking, for oil, for minerals, for water and for land.